the final decision was made by lottery, by pulling names out of an hat, and I was not among them. At the moment I was keenly disappointed and more than a little incensed at the manner in which the selections were made. It had been my impression, and everyone else's too, that merit was the basis of choice, that your past record as a flier and student would have much bearing. Now that I have cooled off a bit I don't mind a bit not being selected. 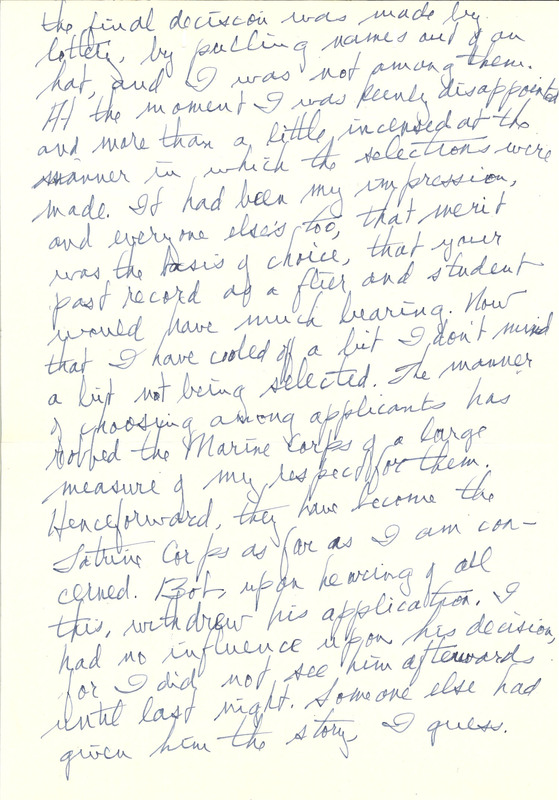 The manner of choosing among applicants has robbed the Marine Corps of a large measure of my respect for them. Henceforward, they have become the Latrine Corps as far as I am concerned. Bob, upon hearing of all this, withdrew his application. I had no influence upon his decision, for I did not see him afterwards until last night. Someone else had given him the story, I guess.